Last weekend I was in the library and a book jumped off the shelf and slapped me in the face. 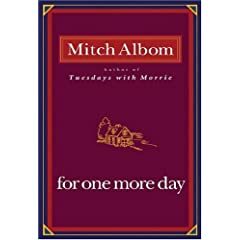 The cover of For One More Day by Mitch Albom is as plain as they come. In fact, if the book had been named anything else I think I would have thrown the book back onto the shelf and kept walking. 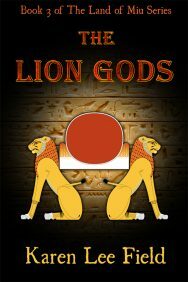 But the title of the book grabbed my attention immediately. Being a bereaved mother, the title spoke to me in volumes. Without reading anything more than those four words, I knew I wanted to read the book. And I didn’t read the blurb or the inside cover, I just borrowed the book and brought it home with me. And my gut instinct was right. As children, we often think our parents are wrong. We don’t understand why they refuse to let us do the things we want to do. We often are embarrassed by them, shy away from them and say things that hurt them. As children, we just don’t get what it’s like to be a parent. As adults, we fight to become our own person. We still don’t understand why everything is such an effort. And why our parents insist on trying to run our lives by telling us what is best for us. As adults, we still don’t understand what it’s like to be a parent. Then we become parents ourselves and suddenly everything falls into place. We finally see the sacrifices our parents made. We finally see the mistakes they made and have been trying to warn us against. Without realising what we are doing, we take on the role our parents had and start doing the same things they did. As parents, we finally understand the love our parents had for us and appreciate the need they had to protect us. If you are a parent now, can you imagine what it would be like to be given the chance to go back and right a wrong with our mother…especially if that mother is dead? For One More Day gives a son that opportunity. Charley’s life is in ruins and he wants to end his life, but he gets to spend one more day with his (dead) mother. He learns things about his family he never cared about when he was a child. He learns things about his mother that would have embarrassed him as a teenager. He learns things about himself from a mother who never stopped loving him and whose wisdom guides him to pick up the pieces of his tragic life. Every family has its secrets. Some children never learn the reason for important decisions made, such as divorce. If we had the chance to go back and spend a day with a lost relative, what would we learn from that time? What would we say? This book affected me because it was written about a mother and son. The fact that the son wanted to kill himself added to my desire to read the book (although it isn’t in any way a main focus of the story). It gives clear reasons why someone with everything can lose focus to such an extent that it can ultimately lead to the lack of will to live. On the other hand, it shows why a family can become dysfunctional and how easily wrong ideas are formulated because people are not told the truth. I highly recommend For One More Day to anyone with a heart. You will not regret the time spent within this world, reading the words and sharing the insights this story has to offer.